Secretariat, an American Thoroughbred racehorse, won the Triple Crown in 1973, the first time that feat had been accomplished in 25 years. In each of the three events that make up the Triple Crown - the Kentucky Derby, the Preakness Stakes, and the Belmont Stakes - Secretariat broke records that are unbeaten even today. The sports television network ESPN declared him the 35th best athlete of the 20th century. He is considered one of the greatest Thoroughbreds in American history and is the first horse to be inducted into the Kentucky Athletic Hall of Fame, an honor achieved in 2007, 18 years after his death in 1989. Making babies is another record-setting claim to fame attributed to Secretariat. In 1976, the first yearling pony ever sold at a price of $1 million or higher was sired by Secretariat. That colt, named Canadian Bound, sold for $1.5 million on July 20, 1976, to a group of Canadian investors. Secretariat’s stud services were taken very seriously. Before any mare hoping to bear a Secretariat baby was inseminated with his sperm, her uterus was flushed out with antibiotics to eliminate any microorganisms that might interfere with her chance of conception. That’s what Dr. Toth does with his patients. The culprit, according to Toth, is Chlamydia trachomatis, a bacterium linked to a number of medical conditions known to cause infertility in women. Toth thinks the chlamydia bacterium is responsible for a substantial percentage of the infertility cases other doctors classify as unexplained. He thinks the infection is much harder to identify and treat than the general medical community does. 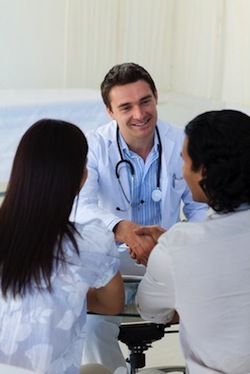 Many of his patients come as referrals from gynecologists and infertility specialists. In Toth’s Upper East Side private practice in New York City, he treats women from around the world with an aggressive series of antibiotic treatments administered intravenously (by IV or injection), by intrauterine washes, orally, and accompanied by steroids. Toth’s treatment includes husbands, too, in a treatment regimen that lasts weeks. Once declared free of infection, the couple is encouraged to start a family. Toth says the longer a couple follows his treatment regimen, the sooner they become pregnant. Richards, Sarah Elizabeth. "Maybe Baby: Infertility’s Controversial Cure." Elle. 30 Ma 2012. Web. Retrieved 6 Nov 2013. Chlamydia Fact Sheet. US Department of Health and Human Services Office of Women’s Health. 8 Jul 2011. Web. Retrieved 6 Nov 2013.